Over the past few years, social media platforms like Facebook, Twitter, Pinterest, along with many others have become invaluable for website owners. As more and more users get onto social media, such platforms are the perfect place to reach them, engage them and market to them. However, the benefits of social media extend beyond merely reaching, engaging and marketing to a website’s audience. Social media can also play a central role in enhancing a website’s Search Engine Optimization (SEO). The real mechanism through which social media enhances SEO isn’t quite straightforward. Search engines like Google and Bing have been known to use social media signals when ranking web pages. However, the exact mechanism through which they do it is unclear. Inbound links (aka backlinks) are essential for SEO. This is because search engines use them to gauge the relevance of a website’s content. One of the best ways of creating backlinks is through sharing your content on social media. When you post your articles, blogs, videos etc on social media platforms, you automatically create backlinks to your website. As the content gets shared, mentioned, retweeted, or talked about, this creates a buzz around the content. The buzz can expose your content to authority websites which can ultimately give you high-quality backlinks. Anecdotal analysis has revealed a direct correlation between shares and backlinks. The more an article or blog gets shared on social media, the greater the number of backlinks it creates (http://searchengineland.com/5-techniques-to-safely-get-links-in-2015-212921). Therefore, social media is a great way of generating inbound links. The only thing you need to do is post your content (i.e. articles, blogs, pictures or videos) on as many social media platforms as possible. At a minimum, you should consistently post them on popular platforms like Facebook, Twitter, Google+, LinkedIn and Pinterest. One of the biggest threats to SEO is a high user bounce rate. Search engines tend to downgrade websites which have a high bounce rate. This is because they imagine that such websites use blackhat techniques for drawing in visitors – when their content isn’t that good. There is only one factor which can lead to a high bounce rate i.e. attracting the wrong visitors. If the wrong visitors land on your website, they will leave ASAP. That is normal and expected. The only way to reduce this is by attracting the right visitors, and that is what social media does. Let’s imagine that you have posted your article on Facebook. Typically, you include a headline, brief summary and a photo or video. You then include a link to your webpage which contains the full article. You can be sure that whoever visits your webpage through the link is looking to read the article. As such, visitors who come through that link are unlikely to have a high bounce rate. The same applies to content posted on other social media platforms. Basically, social media can help in visitor retention. This ultimately improves your SEO. The amount of social media activity around web content can affect how fast it gets indexed by search engines. When your article, for instance, is extensively tweeted, shared or liked immediately after being published, search engines pick up on that. There is evidence which shows that the Googlebot indexes popular posts much faster than ordinary content. For instance, when your article is extensively tweeted, it can get indexed around 50% faster than normal. (http://beingyourbrand.com/2013/03/03/how-social-media-impacts-seo-infographic/) If it is retweeted by authority sites, the indexing time can come down from 2 hours to 2 seconds. When your content gets indexed faster, your SEO improves. This is because your content immediately becomes available in the search engines. This can give you a slight edge in the increasingly competitive marketplace. The Google algorithm now uses “social media signals” while ranking websites. Such signals include number of followers, number of shares/likes/mentions, amount of user engagement (comments) and number of social media-related backlinks. The exact mechanism how social media signals contribute to SERP rankings is unclear nor publicized by Google or the other major search engines. However, the amount of social media activity increases your website’s rankings on specific metrics. These metrics include target keywords, social influence, your domain name and local search. The combined effect of such increases is an overall boost in your Google rankings. Search engines often give priority to what they consider “authority” websites. To be considered an authority, you website content must not only draw visitors, but also have backlinks from other websites. Social media provides a way for achieving this relatively quickly. When you post your content on social media platforms, the amount of activity around them can give you “social influence”. When many people share, like, retweet, mention or comment on your posts, search engines consider them highly valuable. The higher the level of user activity around your content, the higher your level of social influence. Let’s imagine that you write a how-to guide on some aspect (e.g. achieving No.1 SERP rankings), post it on Facebook and it has 10,000 shares. Another person writes a similar how-to guide and it receives 500 shares. When ranking these web pages, a search engine will likely give a higher rank to the page with more shares. It will deem it to have better quality content. This is the power of social influence. Social media plays an important role in SEO and I’ve outlined the benefits above. Therefore, if you want to maximize the SEO potential of your website, then you need an active social media presence. “Active” in this context means linking your websites or blogs to your social media accounts, constantly updating your profiles, posting new content, replying to user comments and generally marketing your social media pages. For all this to fly, you first and foremost need quality content. After all, nobody is going to share, retweet, like, mention or link back to content which is average or mediocre. This brings us full-circle to one of the major cornerstones of SEO success i.e. providing your website users with the highest quality content and having the right website copywriting processes in place so you can maximize your SEO potential. Once you have great content written and in place, then promoting it on social media will be a breeze. And ultimately, you will enjoy the amazing benefits of social media to your SEO efforts i.e. more backlinks, greater social influence, faster indexing and a higher overall Google ranking. Need help with setting up and promoting your content on social media? Don’t lose out on the power that social media can bring to your search engine rankings! Our team has extensive knowledge of all of the major social and bookmarking sites on the web and we’ve love to help get this set up for you. Just call 303-200-1000 or by at sales@seozones.com. 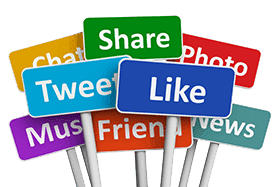 You can also fill out the form on this page and request more information about our social media services and at the same time, you can receive a FREE analysis of your website!